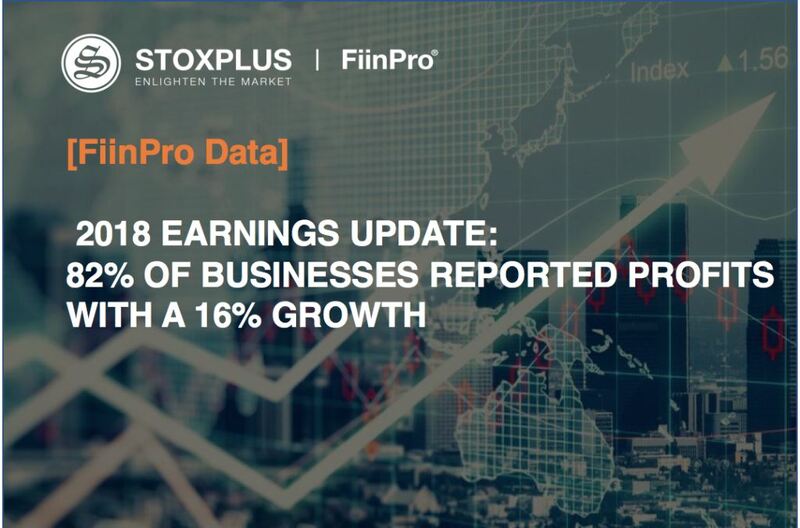 According to statistics from FiinPro Platform, as of January 24, 2019, 434 companies announced 2018 business results with 82% reporting profit. - Total net profit for 2018 of 434 companies (accounting for 26.6% of market capitalization on 3 stock exchanges) reached over VND98 trillion, growing about 16% compared to 2017. However, due to many leading companies have not announced their 2018 business results and this figure may change significantly in the coming time. - 208 companies completed their 2018 plans, including notable ones such as GAS (188%), VCB (138%) and MBS (139%). 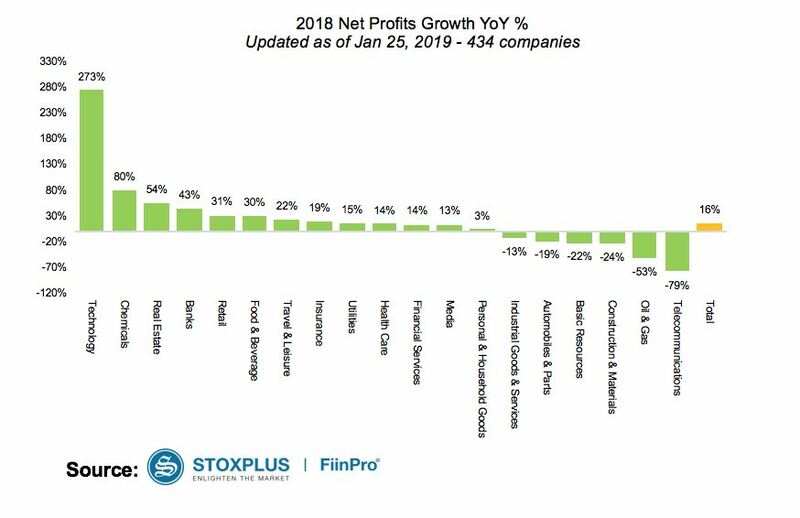 - Large companies with the strongest profit growth last year include MBS (640%), DGC (586%) and NTC (230%). - By Sectors: Technology, Chemicals and Real Estate enjoyed the highest profit growth, respectively 273%, 80% and 54% compared to 2017. Technology sector saw a surge in profits mainly thanks to SRA (829% growth compared to 2017) while large stocks in the industry such as FPT and CMG have not yet released data. - In Real estate, there were 26 companies announced 2018 business results, of which the largest is DXG with the profit of nearly VND1,200 billion (up 57% YoY) and NLG with VND761 billion (up 42% YoY). The total profit of above-mentioned 26 companies reached VND4,671 billion (up 54.1% YoY), in which Q4/2018 profit was VND1,937 billion, up 94% compared to Q4 / 2017. Two biggest companies in this sector are VIC and VHM have not released their results yet. - In Banking, 11/17 listed banks announced 2018 financial statements, with profit growth of 43.2% YoY. Notably, CTG has not announced its business results and could reduce the profit of the whole sector when its Q4 credit decreased by more than VND 26 trillion. - Overall, 2018 continued to be an outperform year for banking when 6 banks achieved profit growth of over 50%. VCB kept leading role with net profit of nearly VND15 trillion, growing more than 61% compared to 2017 and contributing 33% to this sector’s growth. TCB came next with nearly VND8,500 billion profit, contributing 19% to sector’s growth. VIB saw the biggest break-through with the profit of nearly VND2,200 billion, growing 95.1% compared to 2017. - Loans and advances to customers at the end of 2018 of 11 above-mentioned banks reached nearly VND1,900 trillion, up 15% from the beginning of the year and 2.9% from the end of Q3/2018. Despite some improvement, VPB still had high NPL ratio of 3.51%, followed by VIB (2.51%) and STB (2.11%). - Financial services sector had the profit growth rate of 13.5% compared to 2017, in which FTS and MBS were bright spots with the growth of 173.4% and 640.1% respectively. However, Q4/2018 profit of the sector declined 17.7% compared to Q3/2018 due to the influence of large securities companies such as VCI, HCM and VND. This report is the property of STOXPLUS Corporation (STOXPLUS), the information provided in this report is based on sources believed to be reliable but their absolute accuracy completeness or correctness are not guaranteed. This document is not intended to be provided at the request of any organization or individual, nor does it serve the purposes of advertising, selling, buying or holding securities. All views expressed in this report are based on fairness, neutrality and reasonable in the circumstances prevailing at the time. Customers and invetors should only use the information provided in this document as a reference, we are not responsible for any loss to the use of the information mentioned above. All acts of copying, modifying, printing, reprinting in any form of any individual or organization without the consent of STOXPLUS are illegal.